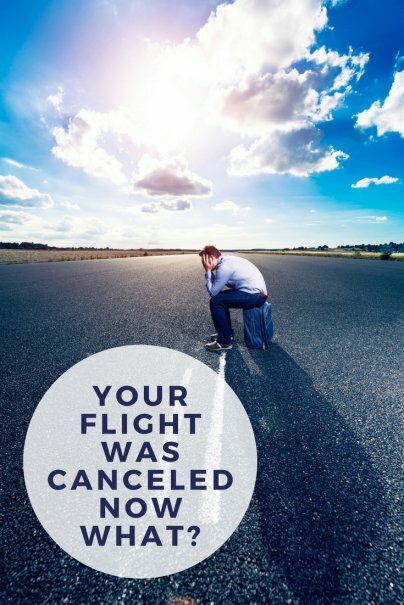 Your Flight Was Canceled. Now What? Home » Frugal Living » Travel » Your Flight Was Canceled. Now What? According to the U.S. Department of Transportation, 23,221 flights by 12 major U.S. based airline carriers were canceled altogether in 2016, and that's on top of the 215,131 arrival delays reported last year. Some 82 percent of flights arrived on time. While the bulk of delays and cancellations are due to inclement weather and entirely out of the control of airlines, some flights are delayed or canceled for reasons airlines can control. Occasionally, a flight isn't canceled but oversold, in which case you may be booted off while everyone else departs. Other times, staffing issues and mechanical breakdowns are at fault. Again, these issues are rarely optimal for airlines, and more of the Murphy's Law of travel. What should you do if your flight is completely canceled or delayed so long it becomes a hardship? Here are some tips that can help you avoid this issue and deal with the outcome. If you're already at the gate when you learn your flight is canceled, you'll quickly find yourself in the midst of an angry crowd. The best thing you can do is get in line, and do it quickly. Then, while you wait, search for alternative flights on your smartphone so you're ready with alternatives once you reach the desk. If you're way back in a slow-moving line, don't be afraid to call the airline while you wait. If you're able to connect over the phone before you get to the gate agent, you may get an answer and be offered an alternative right away. The ideal situation is one where you're rebooked on the next available flight. Unfortunately, this is the scenario everyone else on your canceled flight is hoping for. By searching for flight alternatives and calling the airline while you wait, you can hopefully beat the crowds and score a seat. And if you can't get on the next flight out, you can ask for access to the following flight or even a flight with a partner airline traveling to the same destination. While an airline might not offer assistance if the delay or cancellation is caused by a situation beyond their control (e.g. weather, civil unrest, acts of terrorism, etc. ), they will normally pony up something if the flight is canceled due to reasons within their control. In the U.S., you may be entitled to a room voucher for a stay at a local hotel in the case you can fly out the next morning. You may also be eligible for dining vouchers to pay for your next few meals. For flights within the European Union or arriving to the EU on an EU airline, your rights are typically more robust. According to EU air passenger rights rules, "you have the right to reimbursement, rerouting or return, as well as the right to assistance and a right to compensation. Compensation is due if you were informed less than 14 days before the scheduled departure date." The air carrier has the obligation to prove if and when you were personally informed that the flight was canceled. Make sure you know your rights so you can ask for what you're eligible for. While a refund may not get you where you were going, it's an option to consider when others won't work. With an instant refund, you may be able to book a flight to your destination with another airline, after all. Fortunately, airlines are equipped to dish out refunds for the unused portion of your ticket for flights canceled by the airline, regardless of circumstances. If that's the best case scenario for this particular canceled trip, make sure to ask for your money back right away. How to Buy a Campervan and Travel Across the U.S.
Financial expert and award-winning writer with a focus on personal finance.